News and views on Florida politics. Gainesville City Elections are underway! Vote by mail ballots were sent out last week and are already in voters’ hands (you can request or track your ballot here). You can also vote on election day, March 20th from 7:00 AM to 7:00 PM, and you can find your voting location here. Two City Commission seats are up this year, District 1 (D1) and At-Large 1 (AL1). AL1 represents all of Gainesville while D1 is the Eastern part of Gainesville (map). 60% of registered voters in D1 are non-white, compared with 40% in AL1. D1 is also the only district in Gainesville with a majority non-white population making this seat vital for representation of communities of color. Commissioner Harvey Budd is running for re-election which means he gets to be judged on his actions over the last 3 years. Most relevant to me is when Commissioner Budd voted against living wage increases for City of Gainesville workers (link). He eventually changed his vote, but was one of only two commissioners who later voted against a living wage increase for part-time city workers (link). He also voted against the purchase of the GREC power plant, which is expected to lower the average electric bill by 10% (link). Just last year, he wanted to develop the Weiss property (the largest undeveloped tract in Gainesville), instead of conserving it, which was one key reason he did not receive an endorsement from the Sierra Club. He also held the Gainesville Votes initiative hostage as he was worried people like him wouldn’t be able to be elected if turnout was higher. (link). The thing is, all of these progressive initiatives got done regardless of Commissioner Budd. Hell, he even agrees with many of the things he’s voted against. He wanted to pay a living wage to city workers, just not the way that the other City Commissioners or activists (including 2015 candidate Budd) wanted. He also wanted to purchase the GREC power plant to lower utility costs; he just didn’t want to pay the purchasing price that the rest of the commission agreed to. He supported moving City elections to November but only if there was an instant runoff, which isn’t currently viable for legal reasons, as had been previously explained to him. 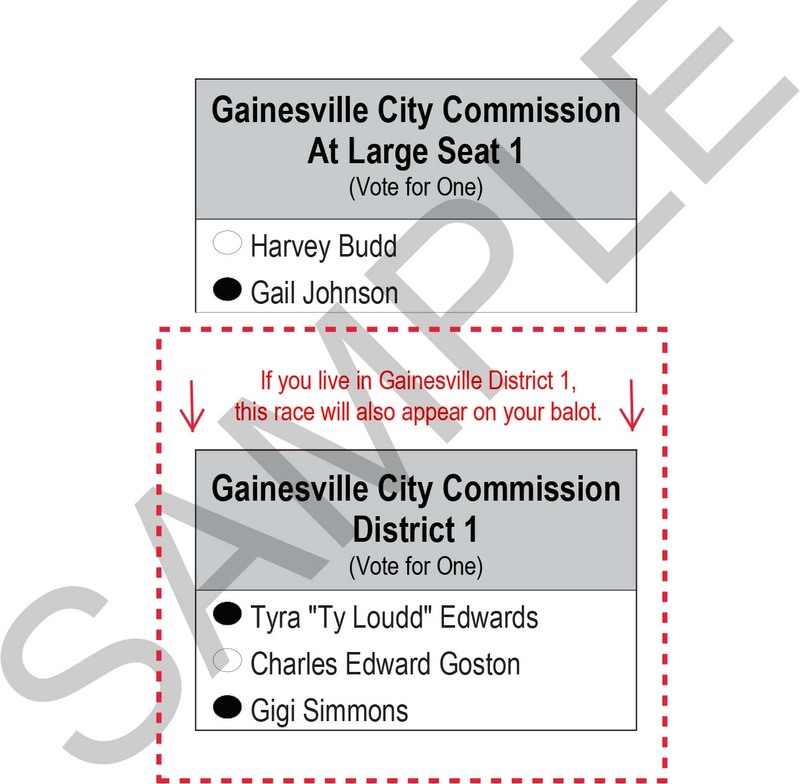 His one vote has been an unnecessary complication for progressive causes in Gainesville. At best he’s been a bad dealmaker and at worst an obstructionist. Many of the progressive organizations which supported him in 2015 are either supporting his opponent or staying out of this race. Gail Johnson is a breath of fresh air in the race for At Large 1. Not only would it be great to have a woman of color on this mostly white (5 out of 7) and mostly male (6 out of 7) commission, but more importantly she would do a great job. Her platform is solid, she has the momentum to beat Budd, and honestly, I can’t wait to work with her to get progressive legislation passed. I expect her to win by double digits. A vote for Gail Johnson is a vote for progress. Commissioner Charles Goston has been in office for 3 years. He’s a former union president and owner of Black College Monthly magazine His record in office has been mixed. Two recent actions which upset me are that he came out against requirements that rental properties meet a basic level of energy efficiency, and he published a wildly inaccurate anti-union article in his publication. For the most part he’s been decent on issues that matter. But as we say in the South, he’s more hat than cattle. He’s know for railing against institutional racism in the city, but has done very little to dismantle it. His boasting has led to him being fact checked by the Gainesville Sun in January and February. His inaction in the city has also prompted two well qualified challengers. Tyra ‘Ty Loudd’ Edwards is an community organizer through and through. She’s an activist who bleeds progressive politics. Edwards attends the leftist meetings, isn’t afraid to be “Loudd” to authority figures, and is someone I consider a comrade in the fight for economic and racial justice. If you’re reading this blog you most likely have met her at the Civic Media Center, the Porters Community Center, or on TV holding the City Commission accountable for their actions (and often inactions) in East Gainesville. Simply put, she’s earned your vote by putting her actions where her politics are. Edwards has only raised ~$1,200 but isn’t running a traditional campaign. She’s knocking on every door she can and focusing on turning out youth of color. Activists candidates have attempted nontraditional campaigns in the past but, to my knowledge, none have been successful. Gigi Simmons is another strong candidate. She’s been on a lot of boards, understands how the city government works, and is very active in liberal causes. She’s been endorsed by the Florida AFL-CIO, Sierra Club, Human Rights Council, Zero Waste Gainesville, and the Gainesville Citizens for Active Transportation. She earned these endorsements because she’s very impressive in her depth of knowledge and her resolve to address problems facing East Gainesville. She’s raised ~$5,000 to Gostons ~$8,000 which puts her in a place where she can run an effective traditional campaign. In order for someone to be elected to office they need 50% +1 of the votes. With District 1 being a three way race it’s very likely that this will go to a runoff on April 17th. Vote for Tyra ‘Ty Loudd’ Edwards or Gigi Simmons on March 20th. Both would be great City Commissioners and you will likely get a chance to vote for one of them again in the run off. While the ACLC doesn’t endorse I found these questionnaires very useful. The Straw Hat Blog at WordPress.com.